Subject: Action spaces from which goods are sent to orders and wharehouse. Lovely game, I'm really enjoying it! I'm somehow confused about the iconography on "Sell Goods" and "Store Goods" actions. The illustration shows three tiles marked as 1 ... X being sent to the one order and to the warehouse. Does this mean that you can send, for example, 5 different tiles, from any of the player board action spaces? My initial thought was that they should proceed from any of the 3 Village action spaces for the warehouse action and the 2 Market actions spaces for the order action. But, in that case, it confuses me that the Market iconography shows three tiles marked as 1 to X and the maximum space possible should be just 2? Same in the Village with 1 to X being understood this way as 1 to 3, as there're 3 tiles placements there? At the Village there is 3 spaces, so you can send 1, 2 or 3 goods at a time. The same goes for the Market and the 2 spaces there. The reason the iconography shows 1 ... X is to show that it is one or more goods. Initially this is limited to 2 at the Market and 3 at the Village, but this can be increased using extension tiles. There is one that specifically extends the Village by another 2 spaces (meaning you could send 5 goods at once) and one that allows you an extra planning space (meaning an extra space for Village or Market). I imagine it also allows some flexibility for future expansions. The reason for the "1-X" iconography is that there are available extensions that serve as additional action spaces. 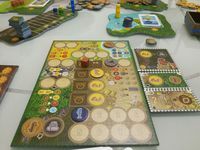 Specifically, there are 2 extensions that each allow 2 more tiles at the village, and there are 2 extensions that each allow 1 more tile that can be used for any action on your action board. Not every player will have those, of course, so the "X" is a variable, not a constant. Yay! Thanks for clarifying, it makes sense to me now. Thanks for your kindness and time.